When it comes to floors, the beauty really is in the details. Pergo laminate ranges are very similar to real wood, stone and ceramic. All ranges feature the TitanX multilayer technology that includes protective layers that resist wear and protect floors from scratches and scuffs. The special impact layers combined with high quality core material and TitanX provide a very high resistance for handling high heels and dropped objects. Over and above this, all Pergo laminates are certified as a good environmental choice made from renewable resources. Van Dyck Floors is the only distributor of Pergo laminates in South Africa and the SADC region. The company has selected three practical, functional and hassle free collections to feature in this issue of FLOORS in Africa Magazine, namely Domestic Elegance, Living Expression Long Plank and Living Expression AquaSafe. 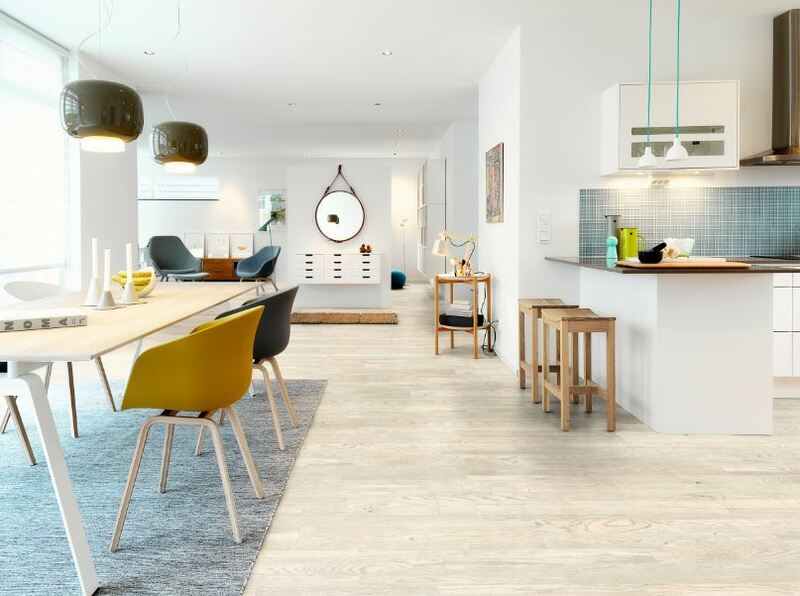 These laminates are inspired by the natural feel of wood, slate and rough concrete, and are available in different contemporary colours ranging from very light naturals and contemporary grey to the more traditional darker wood colours. Pergo Domestic Elegance is the entry level laminate option. It is a 190 x 1 200mm laminate plank collection designed, not only to look great but also to be affordable. There are a variety of different looks and designs and it is available in five contemporary colours. These laminates are a perfect solution when you have a limited budget, with no compromise on quality. The laminates also have a 20-year guarantee and are highly recommended for light commercial and heavy residential applications. The grandeur of large format tiles magnifies the beauty of nature and allows it to stretch all the way into a room. The goal of the Living Expression Long Plank is to create the illusion of a never-ending plank. The collection is 205 x 2 050mm in size with a 9,5mm thickness and comes in six warm colours that highlight the natural character of real wood with their clean visual lines. This flooring product is ideal for light commercial and heavy residential applications. Living Expression AquaSafe is a water-resistant laminate by Pergo. The innovative technology used during the manufacturing process ensures that floors are protected from water. The new matt surface is pressed into the bevels to protect the authentic, true-to-nature surface of the plank, making it ideal for kitchens, bathrooms and hallways. The water repellent coating also covers all edges of the planks to ensure that water cannot penetrate the floor. This makes these laminates very hygienic, easy to clean or maintain for a long time – and by doing so, can compete head-on with LVT’s. This laminate collection is available in a 190 x 1380mm size and 8mm thickness. It is available in six colours and is ideal for light commercial and heavy residential applications. These three ranges offer many benefits such as the innovative Perfect Fold 3.0 click system for easier installations. You just click the planks together and are done in no time. This system also makes lifting floors easy, should the need arise. For more information, contact Van Dyck Floors on +27 800 227738 or visit www.vandyckfloors.co.za.